Named The Spot by the seller, this four bedroom, three bathroom executive style home is located on the premier lot in Upcountry's exclusive neighborhood, Kulamalu Hilltop. This parcel perfectly captures the bi-coastal ocean, West Maui Mountain, and Central Maui views. The disappearing infinity edge over the expansive lawn gives you the feeling of being on top of the world. 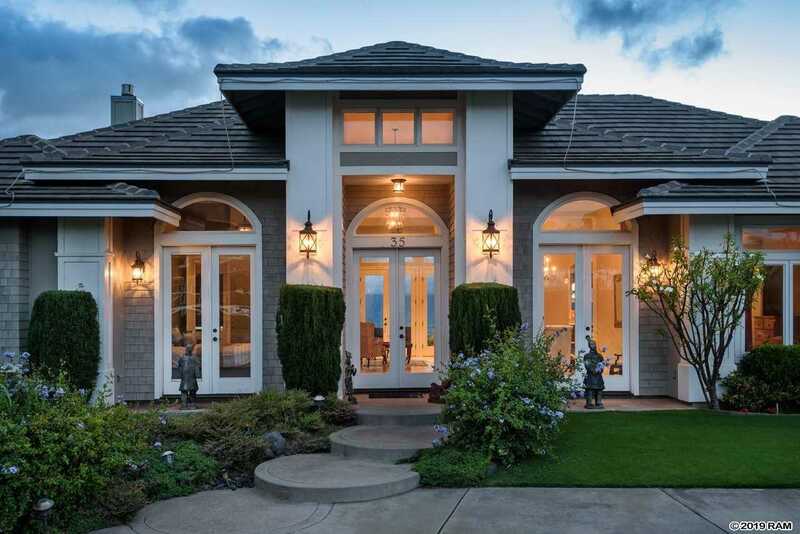 The grand entryway into the home opens to vaulted ceilings and views in every direction. The chef's kitchen has granite countertops, stainless steel appliances, and flows into the casual and formal dining areas as well as the living room. Features include two fire places, 40 panel owned PV system, central air conditioning, solar hot water heater, and a three car garage. Kulamalu Hilltop is gated and secure with an exceptional location close to several of Maui's best schools, and is just a short drive to golf, Costco, the airport, as well as the best of what Upcountry has to offer. Sit back and relax in your hot tub while soaking in the city lights of Central Maui. Life is good. Please, send me more information on this property: MLS# 381653 – $1,980,000 – 35 Ohia Lehua Pl, Pukalani, HI 96768.